In January 2010 PF Olsen commenced its drug and alcohol management programme. Shortly thereafter, on Tuesday 20th December 2011, the Central North Island Random Testing Programme (CNIRTP) Steering Committee held its inaugural meeting, so the programme has been in place for almost 7 years and the next meeting of the committee will be its five-year anniversary. 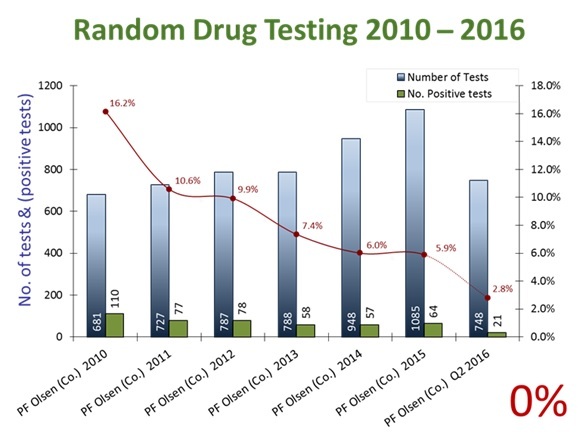 In 2009, following the release of the Forest Owners Association Drugs and Alcohol Code of Practice, PF Olsen set about trying to understand how a testing programme might work. Importantly one that contractors would support and have confidence in. This required contractor feedback, so the company launched a formal survey in 2009 of all its employees and contractors. Additionally, suppliers (testing agents) needed to be sourced and evaluated; tenderers suggestions ranged from towing caravans into the forest, putting up tents, and bringing in buses, and some ideas were not very practical! Eventually it was decided to run with New Zealand’s foremost supplier – now called The Drug Detection Agency (TDDA). That relationship continues till this day. Today, we have a system that the contractors like, it meets the requirements of the AS/NZS 4308:2008 drug testing standard, and operates within the bounds of the law especially the Privacy Act. Indeed, there is a lot of rigour in the current system just to ensure and safeguard the rights that our Workers have in law and we think they appreciate this care of them. TDDA have grown along with the programme and even have a representative on the steering committee. Dealing with testing programmes from around Australasia and even the United States of America, they keep us up-to-date with innovations and trends from across the world and are a ready source of guidance. For example, in 2015 TDDA noticed a significant trend resulting from Reasonable Cause Testing. That data was very compelling so the steering committee organised ‘Reasonable Cause Testing Workshops’ for all PF Olsen contractor principals, crew foremen and company employees. One hundred and fifty four attended and almost everyone commented positively on the education delivered and received. The result has been an increase in this type of testing and greater confidence to take an action when something doesn’t look right while at work. In January 2016 the CNIRTP commenced testing for Synthetic Cannabis (SynCan). Interestingly, while it was available to do so much earlier, the committee decided that it would delay implementing this form of testing until all of the legal requirements were properly satisfied; specifically the development of cut-off limits. Also, prior to its introduction the committee felt that it should take a second formal survey of the collective – primarily to gain a mandate to introduce SynCan testing. The results, which supported the introduction of SynCan testing, were outlined in the March 2016 edition of WoodMatters. This approach has certainly added to ‘buy-in’ by all of those involved and has contributed overall to a noticeable shift in culture. At the end of the day, the success of the collective approach can be clearly seen in its results! The graph below shows the quantum of the issue we were dealing with at the outset and the success of the programme to date. We feel sure that these results will have undoubtedly contributed to the harm reduction experienced by the Company! The graph shows a reduction in positive tests from 16.2% to 2.8% in 6 years – and our goal – ZERO! It is fair to say that a huge part of the result has been achieved by our contractors many of whom are now running their own programmes in tandem with the CNIRTP. This has been a very encouraging development for the steering committee and something it now encourages across the collective. The committee has also arranged for rewards – smoko shouts – for when contractors produce a second consecutive clear round of testing. The ‘shout’ has become a real source of pride for those workers involved. It represents that they have worked alongside their mates to maintain a drug free worksite and produce this excellent result. It is no small change in their lives. More recently, the steering committee has engaged with other New Zealand businesses that are similarly working with programmes to manage drugs and alcohol in the workplace. This has provided some extra insights and will no doubt help to shape our future direction. Without a doubt, the future still holds uncertainty and is subject to change with every new drug type introduced into society. In that case, it is the goal of the CNIRTP (steering committee and collective) to keep ahead of the curve, to remain relevant, and to serve the workers it represents.